This condition usually affects people of all ages but is more common in men than women. The ulnar nerve travels in a tunnel (cubital tunnel) on the underside of the humerus bone at the elbow called the medial epicondyle (some people refer to this part as the funny bone). It then passes under the muscles in the forearm at the side of the little finger and enters the hand through another tunnel known as Guyon’s canal. When the nerve is compressed along its route from the elbow to the hand symptoms of numbness, tingling, pain and muscle weakness may be experienced in the little and ring fingers. In many patients a cause of the compression is not found. At the elbow repeated bending movements can cause stretching and compression of the nerve against the medial epicondyle. Sliding movements of the nerve over the elbow, leaning or falling sleep on your elbow or fluid building up in the elbow are other causes of the syndrome. Compression of the nerve can also arise at the wrist due to pressure on Guyon’s canal from a deep ganglion, swelling in the surrounding tissues or due to occupational reasons. Pain, numbness and tingling are the most common symptoms experienced in the little finger and inner side of the ring finger. They may be noted during bending and straightening the elbow e.g. when holding a phone, or during the night whilst sleeping. Since the nerve also supplies muscles within the hand patients may notice that they are slightly clumsy, dropping things unexpectedly and experience weakness in the hand. The first step is to undergo a consultation, involving a medical history and clinical examination. If indicated Mr. Naqui will organise nerve conduction studies (NCS) and electromyograms (EMG) to assess how well the nerve and muscles in your arm are functioning (see FAQs page). It may also be necessary to perform X-rays, CT or MRI scans if the cause of compression is not obvious (see FAQs page). Treatment is dependent on the underlying cause of the condition. If the cause is related to the positioning or movements of the elbow or wrist, then hand therapist directed exercises, wrist and elbow splinting and a change in the way you conduct your daily work activities might be necessary to avoid putting pressure on the nerve. Non-steroidal anti-inflammatory medications can help reduce swelling around the nerve. If symptoms are persistent despite trying the above treatments, or symptoms are very severe and there is evidence that the muscles are wasting, or that there is a particular swelling or lump that is causing ulnar nerve compression then surgical treatment may be necessary. There are various surgical treatment methods, one of which is chosen after careful consideration of your particular symptoms and underlying cause. Mr. Naqui will discuss the options with you. 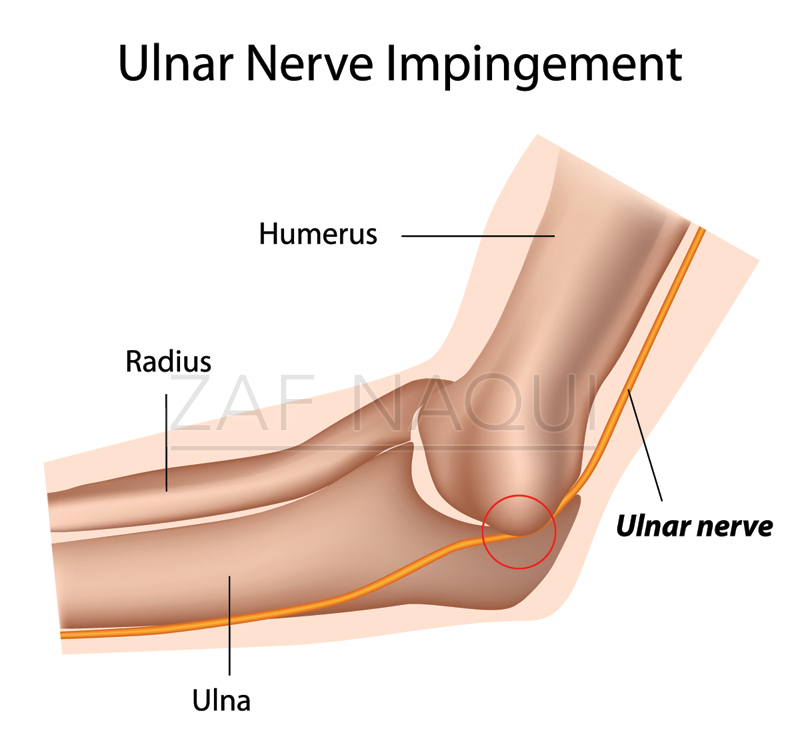 The ulnar nerve can be released from its tunnel, this is known as a Cubital Tunnel Decompression, by cutting through the ligament that overlies the ulnar nerve at the elbow. This increases the space around the nerve and hence reduces the chances of it being compressed. 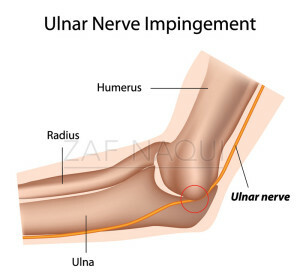 The ulnar nerve can also be moved from behind the medial epicondyle to the front of the elbow, this is known as Ulnar Nerve Anterior Transposition. This means that the nerve does not get caught on the medial epicondyle during elbow movements. This is usually performed in cases having revision surgery. Another treatment option is removing the bone, the medial epicondyle, at the elbow, which also effectively prevents the nerve from catching on this bony surface and being compressed. Should the cause of compression be related to a swelling or lump e.g. a ganglion, in the elbow or wrist then this may need to be surgically removed. Mr. Naqui performs Cubital Tunnel surgery at a number of hospitals around Manchester (see Hospitals page). The surgery usually lasts 30 minutes and is a day case procedure requiring regional or general anaesthetic (see FAQs page). The surgical scar is dependent on the type of surgery required but is usually 7 cm long. Fine stitches will be needed to close the wound. A dressing will be placed over the wound which is usually reduced within 5 days. Taking simple painkillers such as paracetamol regularly for the first 2 days after the operation will help to relieve any post-operative pain. The stitches are will be removed at 10-14 days after the operation either at your GP or when you see the hand therapist at clinic. Mr. Naqui and the hand therapist will provide you with specific exercises to perform after the surgery. The original symptoms of numbness and tingling may not improve immediately after surgery. The actual nerve may take several months to recover from the original compression and in patients with severe symptoms full recovery may not occur. Between 2-6 weeks off work is necessary dependent on the degree of manual work you do. Driving can safely be resumed at 1-2 weeks. Mr. Naqui will discuss with you regarding return to sports depending upon your particular sport. The original symptoms of pain, numbness and tingling may not completely resolve and there may be persistent pain and stiffness post operatively. The risks of infection and nerve damage are small. Recurrence can occur in a small number of patients due to scar tissue formation over the nerve.